The Blackstone LaunchPad powered by Techstars at Syracuse University boasts some pretty impressive stats. With more than 3,300 members hailing from 91 countries and every campus academic program, there is one data point that really stands out. 50% of our members are women, either female founders, or in executive roles. That’s especially impressive because the national percentage of female startups is around 17%, according to a recent study by Crunchbase. The percentage of women-founded venture-backed companies has plateaued at the same low number since 2012. Last year women-led startups only got only 2 percent of venture capital. In 2018, 5% of the Fortune 500 CEOs were women. In the LaunchPad at Bird Library, that magic number is 50/50, which is the name of a video series celebrating Women’s History Month, and the voices of SU female founders and innovators. 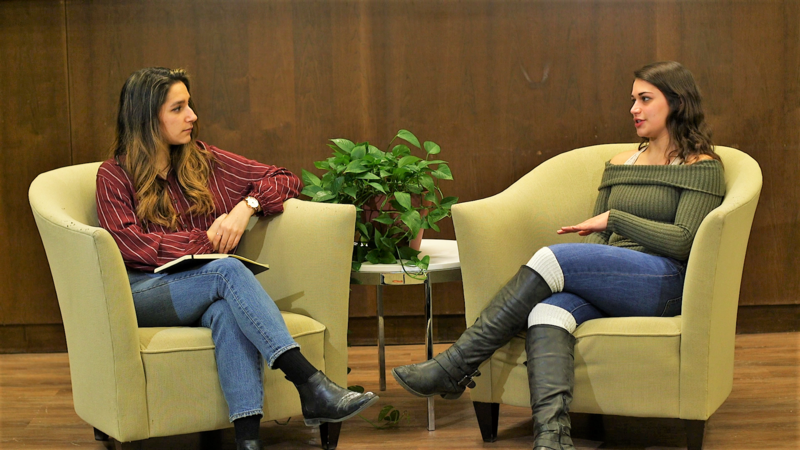 The nine-part series is hosted by Kayla Simon, (pictured, left, in photo above), co-founder of In-Spire (and winner of Invent@SU, Panasci Business Plan Competition, Impact Prize and the RvD iPrize), who is the inaugural Blackstone LaunchPad Watson Scholar. Kayla is a literal rocket scientist, pursuing an aerospace major in the College of Engineering and Computer Science, and was a test site propulsion intern at Virgin Orbit last summer. She spent a day with Richard Branson while performing propulsion testing at the Virgin Orbit location in Mojave, California developing and qualifying rocket engines, and getting LauncherOne to first flight. In the series, Simon interviews Audrey Miller, founder of Strive and Thrive at SU; Geena Matuson, founder of Art Inspires You; Tay Lotte, co-founder of RAVLE; Kelsey Davis, co-founder of COLLCTVE; Emma Rothman, co-founder of Hearts for Emma; Nikita Chatterjee, co-founder of Paani; and Angelica O’Hare (pictured right, in photo above). Simon ’19 was producer and host, and Will DeVito ’20, a Blackstone LaunchPad Global Media Fellow, served as director and editor. Watch for upcoming episodes as we celebrate Women’s History Month at the LaunchPad, and the power of women as change agents across all sectors — from health, to information tech, finance, engineering, design, media, and non-profits. The Blackstone LaunchPad at Syracuse University is training the next generation of women to become business and civic leaders, and innovators in an entrepreneurial world.